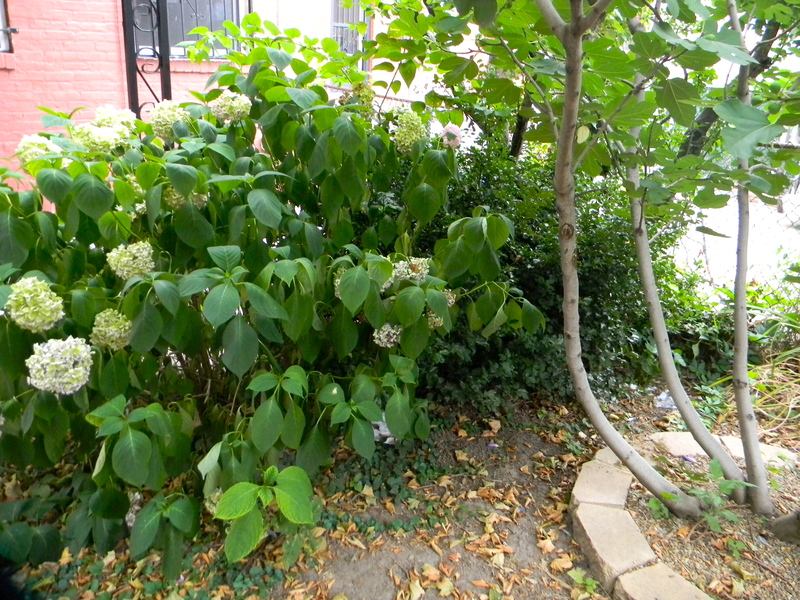 When we moved into our apartment in August of 2010, the Hydrangea in the backyard was in full bloom. That fall I researched how to prune hydrangeas and decided, based on photos and info found here, that our hydrangea must be H. arborescens, an Annabelle type. According to this very helpful site, these types of hydrangeas bloom on new wood (new stems), and that they usually “bloom every single year, no matter how they are treated. 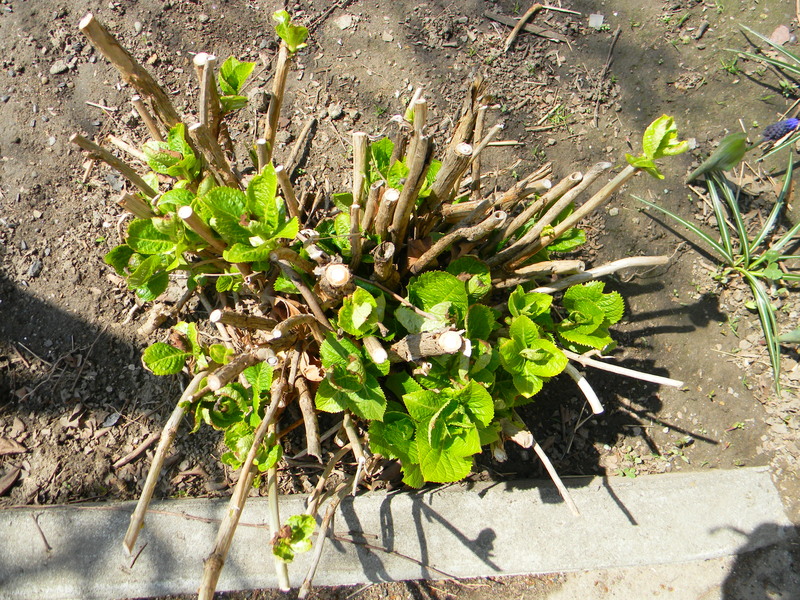 The only time they cannot be pruned is in the spring when they are preparing to bloom.” The site recommends that you prune this type of hydrangea back to a few inches above ground or to about 18″ – 24″ if you want to leave old wood to support the new branches and keep the plant from flattening in the rain. So, that’s what I did. However, I also divided the hydrangea at the same time. It was enormous and was crowded in with a holly (which I have since dug up and given away as it didn’t have a mate and produced no berries.) I gave the hydrangea division to my friend Bev in PA. The only problem? No flowers! Not a single bloom all summer long. I am hoping that the lack of flowers was due to it having been divided the previous fall and not to an error in my pruning methods. This year I have not yet pruned the hydrangea at all, partly because I’m scared to, and partly because the weather has been so strangely warm that I wondered if I ought to wait for colder temperatures…which are kind of upon us now. Is it too late? Here it is now, not yet pruned...showing some buds on those stalks already. Toward the end of fall I noticed powdery mildew on its leaves before they fell off, so I’m hoping that will not make a comeback this summer. This entry was posted in Hydrangea, Pruning and tagged Annabelle Hydrangea, H. arborescens, how to prune a hydrangea, how to prune hydrangeas. Bookmark the permalink. Hmm, very curious! Did you fertilize it at all? Sometimes if plants get too much nitrogen, they just grow lots of lush leaves and not many blooms. For now you can either leave it alone or prune it right above the first or second set of buds (that’s what I do anyway). I hope it blooms for you this year! Not a drop of fertilizer at all. Not even a compost side-dressing. 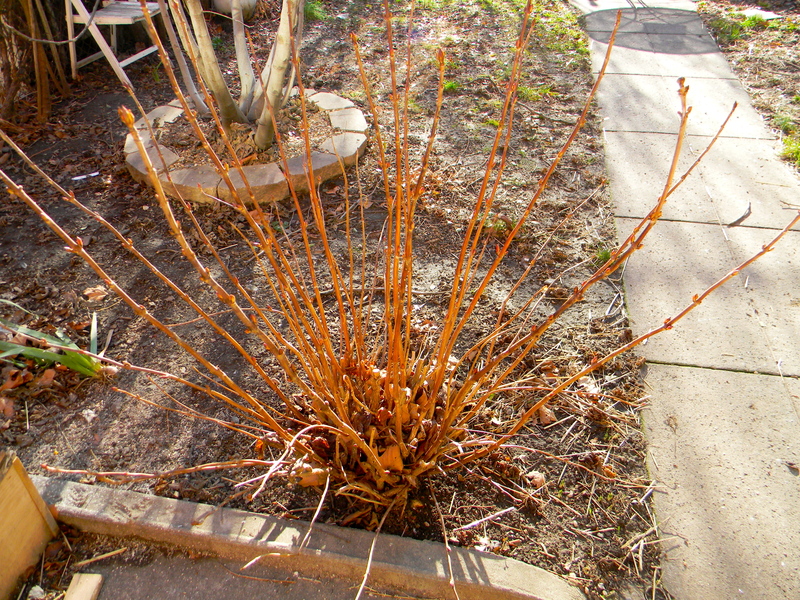 Thanks for the tips on where to prune…I hope it blooms this year too! It was gorgeous when it flowered before! Mostly I LOVED the picture with the kitty hiding in the box! Oh, Mr. Google and I are good friends. Moderation when it comes to hydrangea pruning, huh? Maybe I should let it be and see what happens. Glad you appreciate the kitty in the transplant box, trying to blend in. Her name is Smoke. The feral cats get very, very curious whenever I start any garden projects! I do not prune any hydrangeas until spring and my Annabelles are too new to prune. Some I do not prune at all…sorry I am no help! No worries, Donna. It will be interesting to see what happens to it this year, whatever I do (or don’t) do! It’s interesting to note in the top 2 photos how many branches have leaves and look healthy but also are not producing a flower. So for a mature and good-looking hydrangea of this type, not every branch would be expected to make a bloom. I wonder if this translates to “blooming on old wood”? Meaning slimmer, younger branches would bloom in their later years if left unpruned? 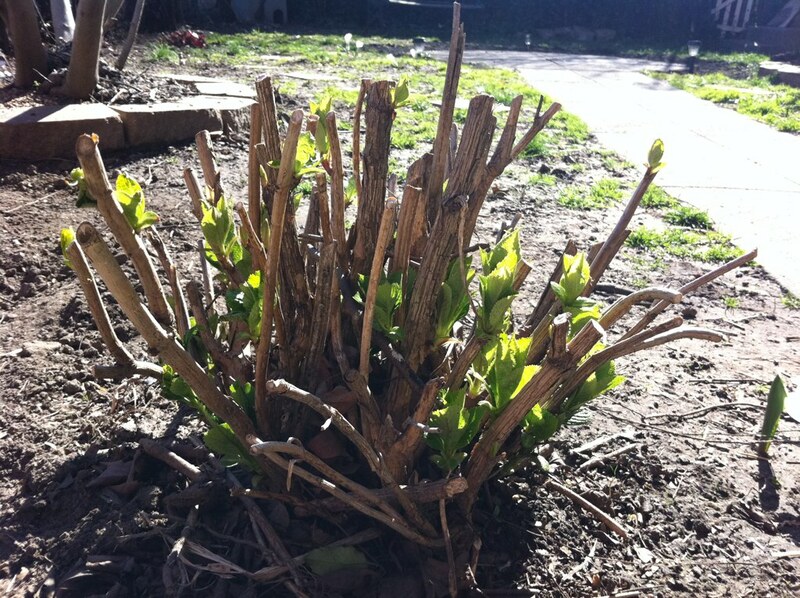 Right now, in winter, I would not cut off anything (unless it’s broken or damaged). **sidebar: I once read that in the plant world, buds can be like fingerprints. Each tree, shrub etc. will display a very unique-to-species dormant bud, allowing plants to be positively identified even when no open leaves or flowers are present. I will have to inspect my division that matches yours and see if I can notice a difference between buds. Although in the pouring rain I must postpone that… Here in PA in its first year the Hydrangea produced a LOT of new growth, looked happy, but had no flowers. I attributed this to its being so freshly divided and transplanted. In your third and fourth photos, some of the woody branches look quite fat. I wonder if those were the ones that had blooms on them prior to pruning… blossoms earned by age? I wish I knew more about comparing types of Hydrangeas. I have two lacecaps, one oakleaf and your division and I guess I have to start paying attention! Thanks, Bev! I think all signs are pointing toward not pruning it right now and seeing what happens. You made some really great observations about the first two photos and how there were a lot of healthy branches and leaves, but not necessarily a lot of flowers. It’s sort of fun to be able to experiment and see what results I’ll get this summer. I’ll be keeping a close eye on it, that’s for sure. I’m curious to see what yours does this year as well! 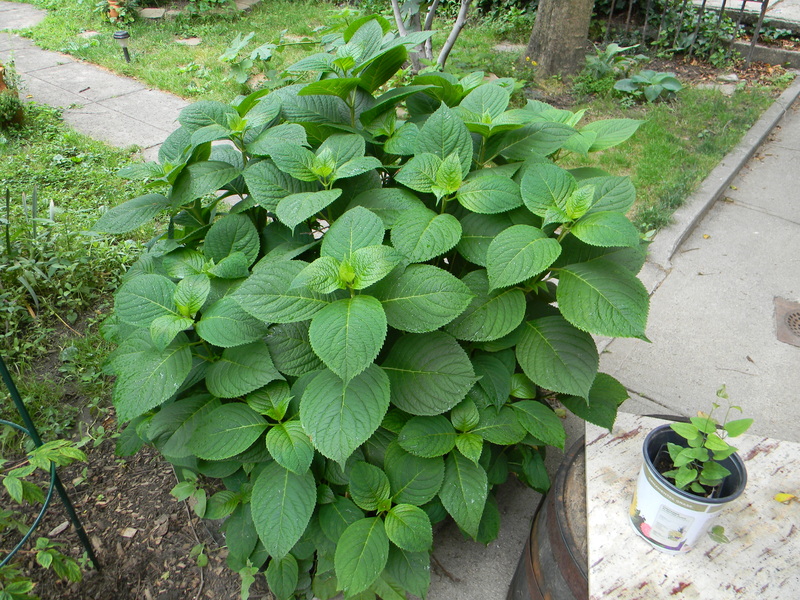 By the looks of the photos I would say that it’s not Annabelle but a macrophylla varitey, also called Bigleaf hydrangea. The leaves are identical to my macrophylla ‘all summer beauty’ and ‘endless summer’. Annabelle has much thinner leaves. They cannot be pruned down to the ground because this variety blooms on old wood and if you cut too much, you won’t get any blooms the following season. What I do with these hydrangeas is just cut off the the dead blooms from last season making sure not to cut the newly forming buds. i always do this in late fall/early winter. Wow. It is entirely possible that I have mistakenly identified this hydrangea. What you’re saying about your variety makes sense when I look at how mine behaved after the drastic pruning! I think I’ll leave it along this year and see what it does. This fall I’ll follow your pruning plan and see what happens! Hopefully I’ll see some blooms this year AND next. It’s too bad our landlords didn’t know what kind it was. “Snowball bush” is what they called it. Thanks for the advice! Unfortunately I agree with Lady Flora – It’s a Hydrangea macrophylla. To me from the first picture (athough it’s really hard to tell) the cultivar is either ‘Endless summer’ or one of the older varieties like ‘Nikko blue’. However, ‘Endless summer’ is what’s known as a rebloomer, it blooms on new and old wood, so even with the major haircut, it probably would have sent up at least a couple of flowers last season. An older variety like ‘Nikko blue’ only blooms on old wood so when you pruned you took off all the flower buds for the following season, which seems to make sense with your pics. Do not do anything now!! No cutting, until the buds start to break. Once all the leaflets start to open you may see one or two stems that have no green – they are dead and you can prune them out (you may not see it this year) Otherwise leave it be… pruning H. mac can be tricky, and best done sparingly in the fall. 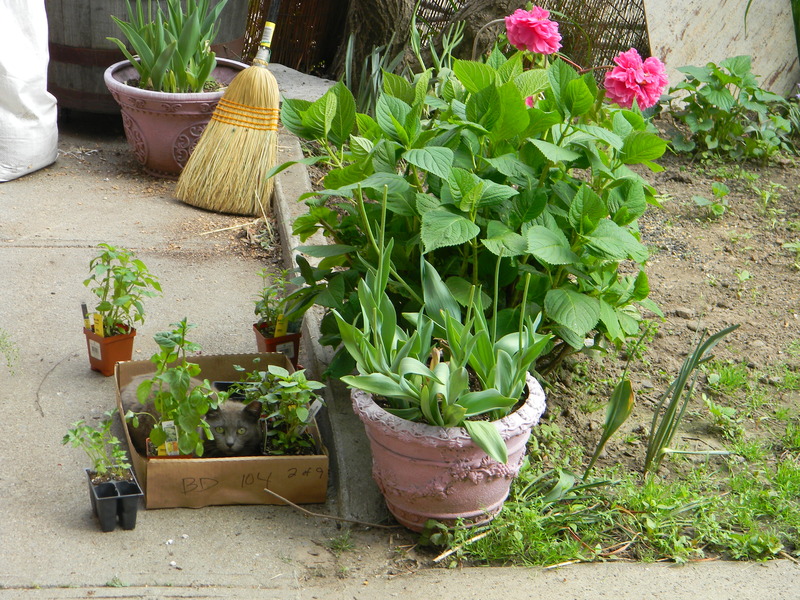 I always say, most of what I know about gardening I learned by trial and error – emphasis on the error! Thanks so much for stopping by and for your advice! I hear you on the “trial and error” part. It’s sad that my experiment cost me such lovely blooms last year. I’m hoping I’ll see a few this time around. I’m so grateful to have some confirmation as to what kind of Hydrangea this likely is (and isn’t.) I will follow your advice about waiting and only cutting stems that have are definitely dead and have no green…and from then on out will wait until fall to prune – sparingly indeed. Thank you again for your help and for the reminder that this is how we learn! Sorry, just chiming in again. A Nikko Blue it might be. The blooms kind of look like that cultivar. And that’s right about the Endless Summer varieties – they also bloom on new wood and if that’s what yours was it would have sent up blooms later in the season. I’m new to hydrangeas, but I became very obsessed with them last year and added 6 new varieties to my garden, have 4 books all about hydrangeas and read everything I could on these shrubs. I think they are just gorgeous and I hope you see blooms again soon on your plant. Thanks, Lady Flora! You and In My Garden have been so helpful – I really appreciate it. When we first moved in, our hydrangea blooms were sort of a pale green / cream, with maybe a hint of pink. Towards the end of summer they lost the greenish tint and stayed a very bright cream color. In fall they turned a magnificent burnished pink color, eventually fading to brown. They were gorgeous. I hope it won’t be another year until we see them again! I look forward to keeping up with your hydranges (six! amazing!) this year, and seeing their photos. I’ve considered getting one called “blue billow” that can tolerate more shade than most hydrangeas. 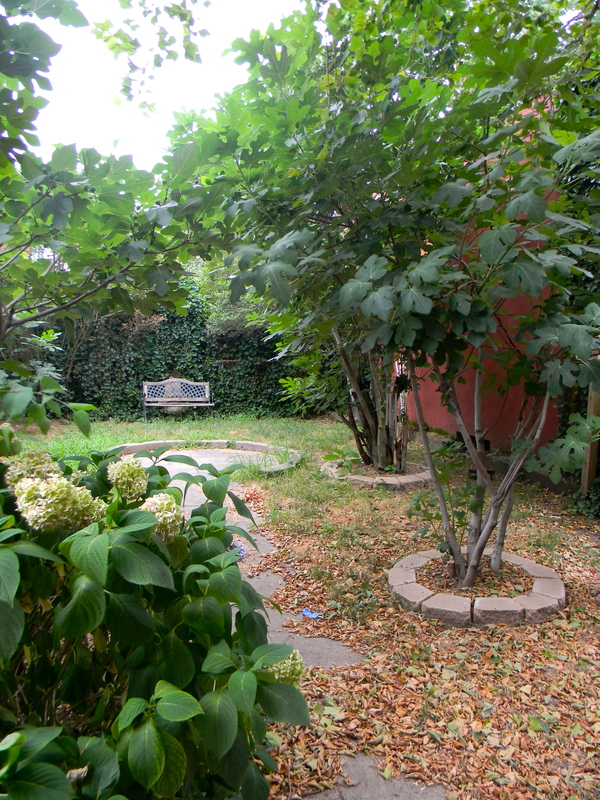 A friend of mine has one of the large Oakleaf hydrangeas – I just love them, but we don’t have the room for it here. They’re huge!